Enter the initial you would like to have stamped on the optional heart-shaped charm. 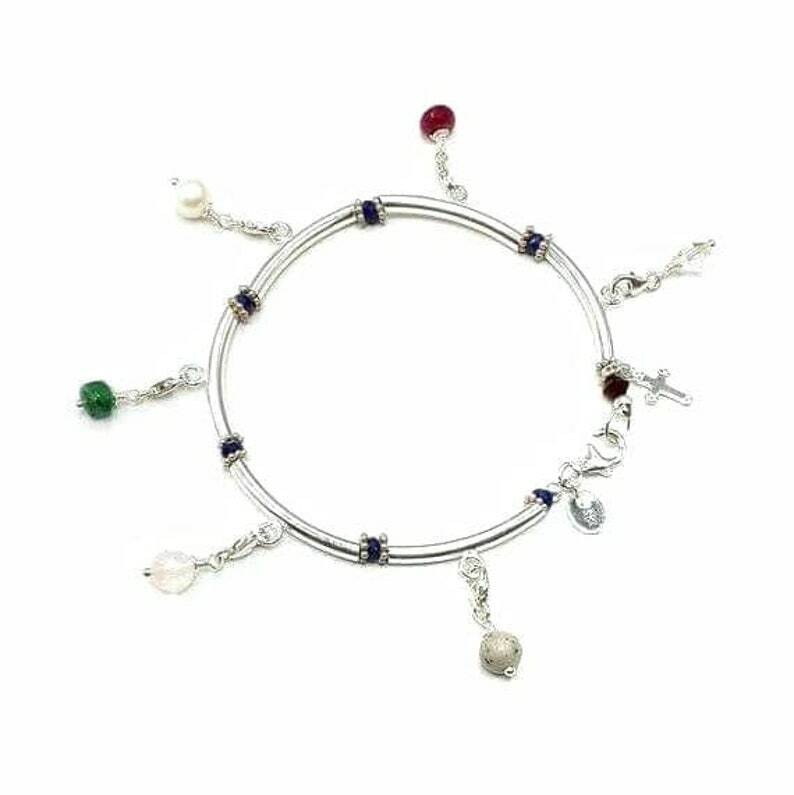 This Bangle Style Sterling Silver Purity Charm Bracelet is a tangible tool for teaching girls their worth. Wearing it encourages self-respect which demands others respect them as well. 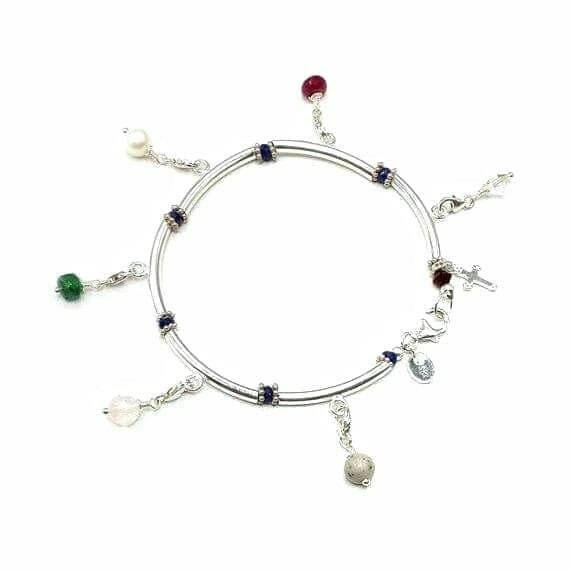 This Bangle Style Purity Charm Bracelet made of Sterling Silver, including a Sterling Silver Cross Charm. It is the perfect gift to give your daughter, niece, or grandaughter when she reaches the age to start dating. Each charm is hand wire wrapped, and has a special meaning behind it. Please read whole description to learn more. 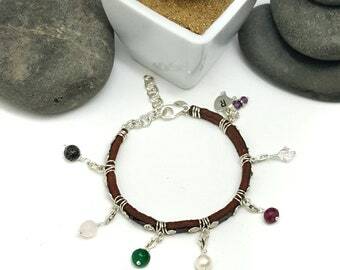 Bracelet is a size 7.5, due to the design it can go larger, but not smaller. Read on to learn about the charms, and meaning behind each one. 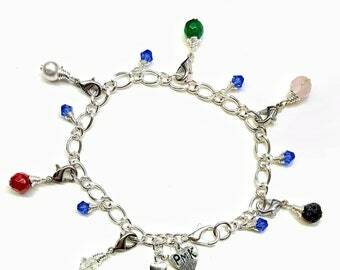 In the story a 16 yr. old girl is given a special charm bracelet by her parents. It has a variety of 6 precious and non-precious gemstones on it, each with a special meaning. ❤️The first stone is a piece of polished granite that the girl is to give to the first boy she holds hands with. ❤️The second is a piece of Rose Quartz to be given to the boy she gives a first kiss to. ❤️The third is an Emerald that she is to give to her first boyfriend. ❤️The fourth a Pearl to give to the first boy she falls in love and says "I Love You" to. ❤️The fifth is a Ruby that she is to give to the boy she accepts a wedding proposal from. ❤️The sixth, a Diamond, she gives to her groom when she marries. ❤️The gemstones are interspersed with small Sapphires, which represent her parents and God's constant unconditional love for her. This is a tangible way to teach daughters that what they have is of value, and to be cherished. Their "charms" are very precious, and they should be mindful as to who they are giving them to. Will that boy cherish them the way they deserve? The hope is that it will be the same boy who receives all of the charms, and that will happen on the day he marries the girl with the bracelet. A card with the meaning behind the charms and the full story is included with each bracelet. Apply today to become a VIP Tree Club and enjoy member-only savings on all your orders. 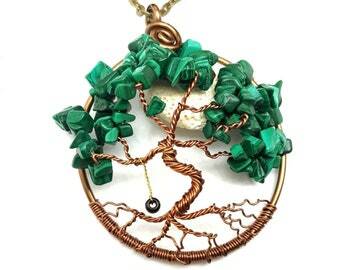 2" Malachite Tree of Life with Scent Diffusing Moon and Tire Swing. You choose the necklace length. Very beautiful ring. Arrived on time. Shopping with Sonora Kay is easy. 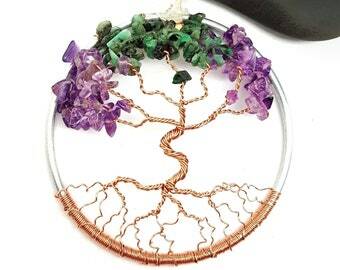 She makes beautiful jewelry. I had Kay create a copper bracelet for my grandmother with arthritis. She’s never owned one before, so she was very surprised opening the package! She loved it, and instantly put it on! It fits her perfectly, it’s crafted beautifully, and it has absolutely no flaws! The copper is shiny and versatile, so it can go with any of my grandmothers other jewelry! I’ll be going to Kay for ALL my jewelry needs! The earrings are beautifully crafted, and they’re so dainty!! I purchased them as a gift for my mother, and when she opened them she was speechless! She loves bears and tribal looking jewelry, so it was definitely one of her favorite gifts! Kay did an amazing job with these! They are flawless, and look like they’ll last for a lifetime! 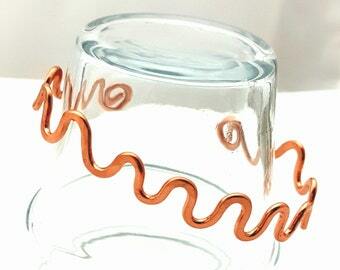 Unisex Copper ZigZag Bracelet, Made to Order from Recycled Copper, Great Gift for all Ages.